Which Are The Brightest Gravitational Wave Sources In Our Galaxy? A couple of weeks ago, the Gaia satellite released data that it has been collecting since its launch in 2013. Among these data were “parallax” measurements (a property we can use to measure how far away something is) for over a billion stars — a revolution for many fields of astronomy. A couple of astrobites last week talked about some results from this data. In today’s paper, the authors used the data from Gaia to look at a group of gravitational-wave-emitting binary stars, and see how visible they will be to the planned LISA mission. When we talk about gravitational wave (GW) detectors, most people think of detectors like LIGO. Two and a half years ago, LIGO became the first experiment to detect GWs. 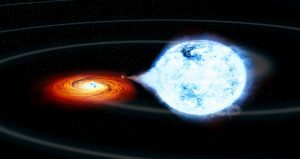 Last year, LIGO and Virgo detected the GW signature of a merger between two neutron stars; again the first of its kind. To date, six GW events have been detected. All of these events involved high mass objects and energies on a scale that we can barely comprehend. Ground-based GW detectors like LIGO and Virgo are, at the moment, the only type of GW detector that we have, but there are more ambitious plans for the future. 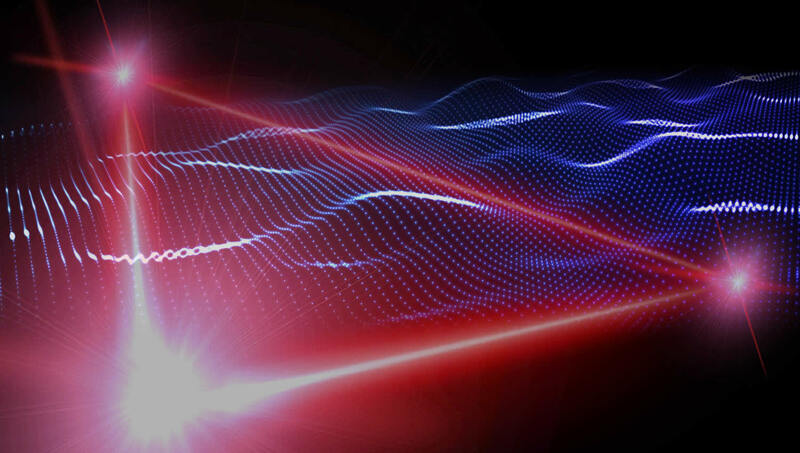 A space-based detector named LISA (the Laser Interferometer Space Antenna) is currently being planned, with a scheduled launch date in the 2030s. It will consist of three satellites arranged in a triangle shape, 2.5 million km apart from each other, connected by laser beams. LISA will be sensitive to lower frequency GWs than ground-based detectors, which will allow it to probe events with higher-mass black holes (such as the swallowing up of a neutron star by a supermassive black hole), as well as allowing it to measure collisions between objects way back during the early universe. Along with these distant events, LISA will detect GWs emitted by objects within our own Galaxy. These Galactic sources will be binaries where the stars are high-mass, dense, and very close together. The most common of these will be a type of binary called AM Canum Venaticorum-type systems (AM CVns for short). Each of these binaries consists of a high-mass white dwarf pulling material from the atmosphere a second star, which might be a white dwarf or some sort of semi-degenerate star. Because the stars are high-mass and close together, they can have orbital periods as short as 5 minutes. These systems will be among the first recognisable systems that LISA detects, which means that — if we’re confident we understand these systems — we can use them to test that LISA is set up and calibrated properly. That is what today’s paper is working towards. The authors have used newly-released data from the Gaia satellite to measure the distances from Earth to all of these binaries that we know of, and from those distances they’ve updated our estimates of how strong the GWs from these sources would be. When we talk about the strength of a GW signal, we use the term ‘strain’, which tells you how much space will be stretched by as the wave passes through it — for instance, a wave with a strain of 10–20 will stretch a 1m ruler by 10-20m (a distance smaller than a proton). Figure 3 shows the strain today’s authors predict for all of their binaries, compared with LISA’s detection threshold. 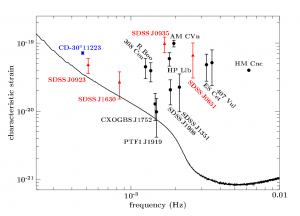 Figure 3: The predicted GW strengths of all targets in today’s paper, shown against the detection limit for LISA. Black symbols show AM CVns, red symbols are double white dwarf binaries, and the blue symbol is a white dwarf + subdwarf binary. Source: Figure 3 in today’s paper. The authors find 13 systems that will be clearly detected by LISA, along with another three that will be marginal detections. As expected, the majority (11/16) are AM CVns. Another four are double white dwarf binaries, and the final system is a binary consisting of a white dwarf and a hot subdwarf (a star somewhere between a white dwarf and a main sequence star). There are a few things that can be done in the future to improve these estimates. For some of these systems the masses aren’t known, and the authors had to make ‘educated guesses’ based on the masses of similar systems, and increase their error bars to take into account the likely range of masses. If a way can be found of measuring those masses directly, it would allow us to make more precise predictions for the GW emission of these systems. However, the Gaia distances are a big step towards understanding these systems, and a necessary step if we are going to use them to calibrate LISA. Keep an eye on this exciting area of astronomy! A new path to gravitational waves Observing across the gravitational wave spectrum The Serendipitous Discovery of Two Stellar Mass Black Holes in the Globular Cluster M22 Can you hide a super-massive black hole? re the strain explanation – is it that the distance between two freely falling masses which are 1 meter apart will move by 10-20m or are you saying that a physical ruler will stretch by that amount? i thought a physical ruler would not do the same due to its mechanical properties. thanks for any clarification.